Yvonne’s contemporary jewellery is inspired by sculptural and architectural forms, her creations have simple, clean lines and make a strong statement. 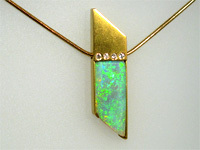 Her one-off handmade pieces often incorporate diamonds, opals and unusual gemstones, and the designs evolve from the shape and colour of the stones. Conflict free suppliers are used for all diamonds and gemstones, recycled precious metals are used whenever possible. Because of fluctuation of the gold price at the moment, the cost of items listed on the web-site are a guide only, please telephone for current prices. Yvonne specialises in making bespoke commission jewellery designed and made to your requirements, using silver, gold, platinum and palladium. Your old jewellery can be melted down and recycled to produce new pieces that are not only exclusive but have real sentimental value.